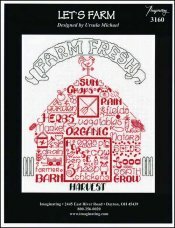 Let's Farm [H1485] - $6.00 : Yarn Tree, Your wholesale source for cross stitch supplies. Cross stitch chart from Imaginating. Designed by Ursula Michael. What a great pattern to stitch for the farmer in the family! This design features a red barn stitched in the middle, with farming words & phrases. "Crops," "Grain," "Farmer," etc. are just a few of the words stitched to make up the design of the barn. A watering pail, wagon, carrot, etc. are just a few of designs stitched among the words. A "Farm Fresh," sign is stitched at the very top. Stitch count 103 x 120. Stitched on #2936 Zweigart Aida 14ct. White. Antique White Zweigart Hardanger 36"x43"